With our four bedrooms, five and a half bathrooms, four spacious and comfortable living areas, a dining area that fits 12 people, full kitchen, and pool... well, you might not ever leave the villa. There is a total of more than 300 sq. meters of living space in the villa with a large garden and parking area. The first floor master bedroom on the ground level has a custom king+ bed, a walk-in closet, a private open-air shower and bath, and doors that slide onto the pool deck. Painted, embroidered, and stone-carved scenes from the Ramayana add a very Balinese touch. The second floor hosts a large master bedroom with a king+ bed, and a large en suite bathroom. The beautiful hand-stitched bedcover, a 70-year old antique wood painting from Klungkung, and bright Balinese textile hanging add color and tradition to the room. This bedroom contains comfortable twin beds, a closet, and an en suite bathroom. Furnished with cheerful colors and paintings, this room is perfect for children and singles. 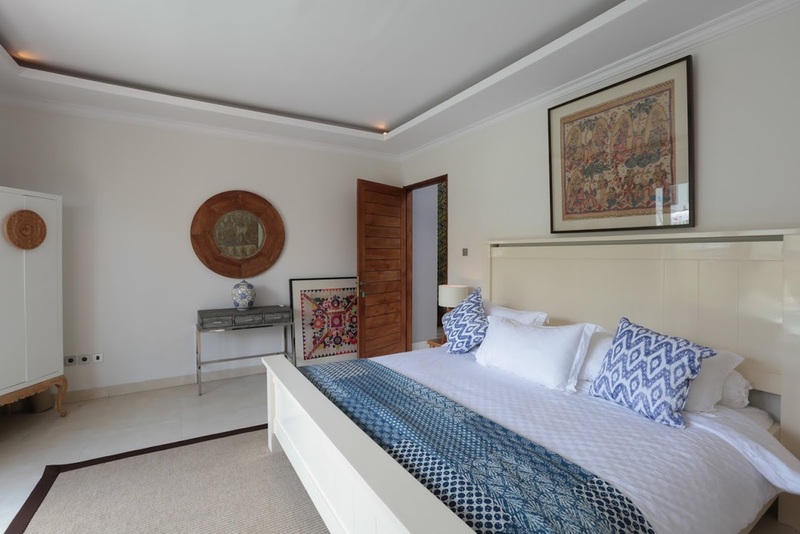 The third floor hosts a queen sized day bed and a terrace that opens up to the lush green rice paddies of Canggu. Guests staying in this bedroom have their own washbasin and bathroom with a toilet and shower. The villa was designed primarily as a place for loved ones to spend time together. With that in mind, the living spaces are the heart and soul of this house. The first floor living quarters includes a large teakwood table that can accommodate up to twelve people for meals. A SONOS surround sound speaker system is available to provide great quality music and the sliding doors open up to allow for ocean breezes to cool the living area. A kitchen island with bar stools for serving casual meals, snacks and drinks is a favorite hang-out spot, and the kitchen itself is fully equipped for your cooking needs. The second floor hosts an open air gathering space with lounge chairs and couches. On the far side of the villa there is a separate entertainment room with a high teakwood ceiling, sunken comfortable couches, a 55 inch HD LCD television with cable access, and hardwood wooden floors. This is a perfect spot to watch TV or movies on a rainy day, or host a gathering to watch your favorite sport! The fourth floor viewing room is home to sweeping panoramic views of the island, from the Balinese strait on the East, to the heights of Gunung Agung on the West. Relax with an ice cold beer, wine, or a refreshing coconut on the lounge chairs or in the balai bengong around the pool, to tunes from the portable SONOS sound system.